Smoking-related interstitial lung diseases (SRILD) are a heterogeneous group of entities of unknown cause. These diseases include desquamative interstitial pneumonia (DIP), respiratory-bronchiolitis-related interstitial lung disease (RB-ILD), pulmonary Langerhans’ cell histiocytosis (LCH) and idiopathic pulmonary fibrosis (IPF). 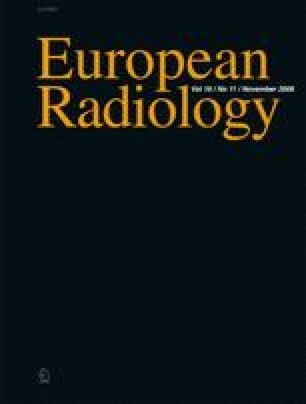 High-resolution CT is highly sensitive in the detection of abnormalities in the lung parenchyma and airways. Ground-glass attenuation can occur in DIP and RB-ILD. Whereas DIP is histologically characterized by intra-alveolar pigmented macrophages, RB-ILD shows alveolar macrophages in a patchy peribronchiolar distribution. LCH shows nodular infiltrates on histopathological examination containing varying amounts of characteristic Langerhans’ histiocytes. The HRCT findings are characteristically bilateral, symmetrical and diffuse, involving the upper lobe zones with sparing of the costophrenic angles. The most prominent CT features are nodules (sometimes cavitary) measuring 1 to 10 mm in diameter, cysts and areas of ground-glass attenuation. Pathologically, IPF is characterized by its heterogeneity with areas of normal clung, alveolitis and end-stage fibrosis shown in the same biopsy specimen. High-resolution CT findings consist of honeycombing, traction bronchiectasis and intralobular interstitial thickening with subpleural and lower lung predominance. Since coexisting lesions in the same cases have been observed, a better understanding of the different smoking-related interstitial lung diseases (SRILD) allows a more confident and specific diagnosis.